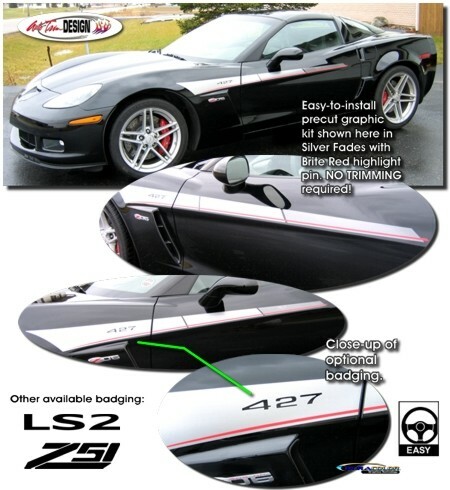 Add a unique look to your '05-'13 Chevrolet Corvette C6 or Z06 with this classy body side graphic kit! Easy-to-install precut kit (NO TRIMMING required!) features a fade design with a highlighting pin as shown. Offered here in this Garage Sale in Black Fades with a Brite Red Highlight and "427" Badging. Manufactured to be installed .25" (6.35mm) above the C6/Z06's upper body line, graphic kit fits perfectly with your Corvette's body line as shown. Please Note: This graphic kit is vehicle specific and will not fit any other vehicle than noted above.